Do you wish you knew how to become a highly successful guitar teacher? You can actually learn a lot about this by observing athletes who participate in the Olympics. Most athletes who compete in the Olympics are very similar in terms of size, strength and overall physical ability. In most cases, there is only a tiny gap between those who go home with gold medals and those who end up with nothing at all. Imagine how disappointing it must be to train for many years, develop your skills to the highest level (at least equal to the skills of the other competitors) and be just a step away from the gold medal… only to lose and leave your Olympic dreams behind for good. Truth is, teaching guitar in your local community is not so different from this. There are tons of guitar teachers around the globe, but only a tiny fraction of them build successful businesses and get significant results for their students. Everyone else works just as hard at becoming successful but are unable to realize their goals, make a great living through guitar teaching and produce great guitar students. How do I know? I’ve been in both positions. Many years ago (when I first began teaching guitar) I struggled while trying to build a successful teaching business before becoming the world’s leader in guitar instruction and the guitar teacher trainer of many great guitar teachers all over the world. Nearly all guitar teachers who are having a hard time building successful businesses think the following: “Guitar teachers who are really successful know more about music or have special guitar teaching knowledge”. Although there is certainly some truth to this, these things are not the ONLY things required for achieving massive success in your guitar teaching business. Over the past 25 years or so I’ve spent teaching guitar, I’ve learned what sets apart the small fraction of highly successful guitar teachers from all other teachers. The crucial element needed for becoming a highly successful teacher has to do with how solid your foundation is for your guitar teaching business (this is not related to your musical skills or teaching knowledge). Of course, it should be understood that you always need to work on becoming a better guitar teacher by improving your teaching methods. However, if you want to achieve great success in your teaching career, you must focus less on working IN your guitar teaching business (by ‘only’ working on daily tasks relating to actually teaching lessons, preparing materials, etc.). and you must invest more time into working ON your guitar teaching business as a whole. The elements that build the foundation for all successful guitar teaching businesses include developing a unique niche, building effective referral systems, enforcing a solid teaching policy, understanding the process behind ‘consistently’ getting new ‘serious’ students, forging win/win partnerships and much more (you can find the extensive list by checking out this resource about building a guitar teaching business). The bottom line is most guitar instructors either completely ignore these things or don’t work hard enough on them to build their business and become the number one teacher in their area. 1. 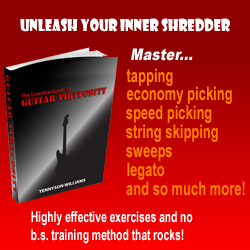 It’s much easier than you would think to change the way you run your guitar teaching business. It just takes a strong desire to get started – the work is not actually very hard at all. Most of the guitar teachers I train are surprised when I show them how easy it is to become successful in this business. Any guitar teacher would prefer to work with serious, highly dedicated students who practice often, respect lesson policies and make the fastest progress. These kinds of students are fun to work with, but most guitar teachers are clueless when it comes to attracting them. In order to get these students to work with you, you must first create an environment that is optimal for these students to work in. Working on the elements above will help you do this. You will make A LOT of money teaching guitar once you begin treating your lessons like a ‘business’ and invest the time into building the foundation that is required for it to run smoothly. Additionally, when you do this, you won’t have to work 40 hours a week (in fact, you can work much less than full time). With this in mind, you’ll need to do many things that most guitar teachers don’t do. Learn about these things by reading this free eBook about making money as a guitar teacher. Once you are able to attract serious guitar students, you will also be able to keep your students taking lessons for longer periods of time. The reasons why this happens are a) serious students are more likely to study longer with you and b) finding creative ways to inspire your students to keep studying with you is a critical aspect of building a successful guitar teaching business in the long term. One of the greatest things about having serious guitar students is getting a lot more referrals from them (compared to how many you’ll get from average students). It’s likely that your most dedicated and serious students already know other guitarists who are also serious about getting better (and are looking for the best local guitar lessons). After they see that their friend is taking lessons with you and is making progress, they will see you as the best option when choosing a new teacher. 1. As discussed above, when you work hard to develop a strong foundation for your guitar teaching business, you will naturally attract more serious clients. These people will have a much higher level of motivation to get better on guitar and closely follow your instructions for doing so. This means they will get better at a much faster rate than other guitar students. As a result, all your other students will (usually unconsciously) become inspired to get better so they can reach the same level as your serious students. By applying what you learn from this article to develop your guitar teaching business, you will inspire all your students to get better results. 2. Once you begin expanding your guitar teaching business and start making a good income, you will find it much easier to help your students improve their skills in new and creative ways that you would never be able to do if you weren’t making much money from teaching (like the majority of guitar teachers). 1. Soak in as much information as you can about how to develop a rock solid foundation for your guitar teaching business by first reading the advice in this free resource about making money as a guitar teacher. 2. Invest some time each week into working ON your guitar teaching career rather than only concentrating on preparing lessons, teaching materials, etc. 3. Follow the same path as the athletes who win in the Olympics by finding a coach who will train you to become successful in your guitar teaching business so you can beat out any local competition. Your coach will not simply name the actions to take and assume you’ll do it on your own, he will hold you personally responsible for your progress and guide you ever step of the way. Gets started earning good money in your teaching business by reading this eBook about making money as a guitar teacher.